With Ollie still recovering from his injuries at the hands of Brother Cyrus and an accidental injection of blood thickener, he might be forgiven for forgetting that it's almost Christmas. As Roy Harper searches for answers in the mysterious murder of a local artist and Ollie continues his hunt for the people building an army of super-strong soldiers, The Arrow will be visited by three spirits - ghosts from his past with messages about his future. Is Ollie going mad? Or merely taking his first difficult steps out of the darkness and into a brighter future? On the island, Oliver, Sara and Shado are at the mercy of Professor Ivo and Ollie will be forced to make a sadistic choice between both of the women he's loved. Charles Dickens' A Christmas Carol (the appearance of three ghosts inspire a man to change his ways at Christmas time), Green Arrow: Year One (The Island sequences), Green Arrow: Quiver (Slade's line about Oliver looking like he saw a ghost is virtually identical to a running gag line about various people seeing a back-from-the-dead Oliver Queen), Green Arrow: The Archer's Quest (Barry Allen makes Oliver Queen - and the rest of the Justice League - costumes made of compressed fabric) and The Flash: Rebirth (more references to the Geoff Johns revamp of Barry Allen's origin story). Barry seems to forget about his boss's threats regarding his job from last episode, staying in Starling City for at least two more days to help out around the Arrow Cave. We've seen Stephen Amell and Caity Lotz show their acting chops playing three or four variants of the same person on this show. Manu Bennett can now be added to the list of actors on this show who have accomplished this feat. This episode sees him playing the tough-guy mask Slade Wilson wears on the island, the vulnerable man who fell in love with Shado, the ghost of Oliver's memories of Slade and - finally - the modern Slade, still alive and well and holding a grudge. The whole of the scene with Ollie fighting Slade's ghost in the Arrowcave. Writing . Music. Performances. Cinematography. Lighting. Everything is perfect. While I generally like Geoff Johns' writing, I haven't always liked how he's portrayed Oliver Queen in the comics. And yet this episode - co-written by Johns and series writer Ben Sokolowski - prefectly captures three essential points to Oliver's character in the lessons he is taught by his ghosts. Shado tells Oliver that he should fight to protect the living - not to honor the fallen. Slade tells Oliver that the real reason he fights is to atone for his own sins. Finally, Tommy reminds Oliver that sometimes you fight because someone has to fight back. Barry suggests Oliver wear a mask made of compressible micro-fabric. This is the same material in the comics that Barry eventually uses to create his costume as The Flash, folding it up inside a ring to be easily retrieved when he needs to change. In the story Green Arrow: The Archer's Quest, it is revealed that Barry made costumes of the same compressible micro-fabric material for his teammates in The Justice League before it was pointed out that only a person with super-speed could effectively utilize such a ring. The founder of STAR Labs is identified as Harrison Wells. In the comics, the founder of STAR Labs was named Garrison Slate. Quentin Lance's former partner is named Lucas Hilton. This is also the name of a cop character created by Arrow Executive Producer and comics writer Andrew Kreisberg , during his run on the Green Arrow/Black Canary comic. Slade's line about Ollie seeing a ghost is very similar to a line repeated in Green Arrow: Quiver. In that story, Oliver Queen comes back from the dead and says that line to people who are astonished to see him. The Asian reporter covering the particle accelerator story in Central City is named Linda Park. This is a reference to a reporter from The Flash comics, who eventually married Wally West - a.k.a. The original Kid Flash and Barry Allen's successor as The Flash. In the original The Flash comic, Barry Allen gained super-speed powers after being thrown through a shelf full of chemicals while being struck by lightning. It is unknown what role the multifunctional particle accelerator has, if any in his origin in the Arrow universe. However, it did appear that Barry was already moving faster than his surroundings immediately before the lightning strike. Barry determines that Ollie was injected with a coagulate which causes his blood to become unnaturally thick. He treats this by injecting Ollie with rat poison. Most rat poisons are anti-coagulates that kill rodents by thinning their blood over an extended period. While the same base chemicals are used in drugs to treat overly-thick blood, it should be noted that most doctors do not recommend taking rat poison as an alternative to prescribed medication. Barry is able to recreate a fingerprint by adding a gel-based polymer to the residual oils from Brother Cyrus' skin from where he grabbed Ollie's neck and cut the skin. Oliver says the reason he doesn't wear a mask is that it won't conform perfectly to his face and would hinder his ability to aim while on the run. Barry suggests Oliver look into a mask made of compressible micro-fabric to hide his identity, saying that green grease-paint isn't very effective at hiding his identity. 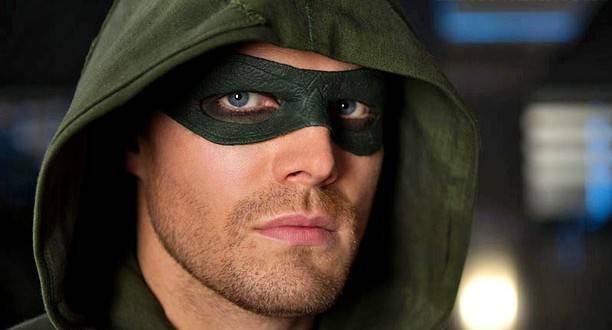 By episode's end, he has made such a mask for Oliver. Ollie: (gripping the arrow with both hands) Roy? This is going to hurt. Roy: My anger's dulling the pain. Slade: What's the matter, kid? You look like you've seen a ghost. Slade: You're not a hero. Or a friend. Or a brother. You are nothing. Slade: Do not turn your back on me! Not again! Slade: Wherever I am... it's time you joined me! Tommy: I know I called you a murderer but you are not. You are a hero. You beat the island. You beat my father. So fight, Oliver. Get up and fight back! Deathstroke: Death would be a release from this life and his sentence has yet to be carried out. I'm going to tear everything he cares about away from him. Destroy those who choose to follow him. Corrupt those he loves. Once he has lost everyone and everything he values, I will drive an arrow through his eye. Shado is confirmed to be dead. Slade is confirmed to be alive and holding a grudge against Oliver. Felicity refers to when Moira shot Oliver and he turned to her for help (114) and when he revealed his identity to Diggle in order to save his life (103), while arguing with Oliver about her revealing his secret identity to Barry Allen. Moira decorates the house for Christmas alone, saying she won't be throwing a big party this year, referring to the disappointing turn out for the party in 208. Ollie hallucinates Shado twice - once while he's on the table being treated by Barry and later as he's walking down the halls of Queen Manor alone. She asks him to give up being The Arrow before everyone around him dies. Diggle confirms that Ollie prefers to be called The Arrow now. Barry mentions The Arrow's battles with The Dollmaker (203), Count Vertigo (207), Dodger (115) and The Huntress (117). Blood sends Laurel flowers and asks her to go Christmas shopping with him. Oliver still addresses Quentin Lance as 'Detective' as The Arrow. Ivo kills Shado after Oliver throws himself between Ivo and Sara, after Ivo trains his gun on her. Laurel discovers that all the blood donors at Blood's drives were required to take a psychological evaluation by the Langford Institute. Felicity and Barry go out to eat together at the Big Belly Burger - not seen since last season. Ollie hallucinates Slade twice - once on the rooftop of SCPD headquarters while talking to Quentin Lance - the other in the Arrowcave. Slade tells Oliver that he became The Arrow to atone for his own sins - not make up for his father's mistakes. Oliver finally tells Diggle and Felicity about Shado. He tells Diggle about Slade Wilson. Diggle admits to seeing the ghosts of soldier friends who he outlived. Roy discovers that Max's file photo is stamped with the word Mirakuru - the Japanese name for the Miracle/Miraclo drug. This name will be used henceforth. Oliver kills Cyrus Gold after triggering an explosion, which sprays more Mirakuru on Gold while collapsing a ceiling on him. The smart money is we have not seen the last of him. Ollie hallucinates Tommy during his fight with Brother Blood and Cyrus Gold. Tommy tells Oliver that Tommy was wrong to call him a murderer and that he is a hero. Oliver is able to save Roy's life by performing CPR on him after he apparently dies from taking Mirakuru. He then returns Roy to Thea's room at Queen Manor. Roy's memory of the event is fuzzy and there's no indication he knows Ollie is The Arrow. Blood formally announces his run for mayor. The "friend" who gave Blood the Mirakuru sample is revealed to be Slade Wilson. Thanks to the Mirakuru, Roy's injuries from last week have healed completely. It remains to be seen if Roy has gained enhanced strength and reflexes from the injection as well. Sara lies to protect Ollie when Slade discovers Shado's death. Slade asks who killed her. Ollie is about to say "I did" when Sara cuts him off and says "Ivo". Barry has a bulletin board filled with materials regarding his mother's murder. Barry Allen is struck by lightning and thrown through a rack of chemicals. Barry makes Oliver a green mask that Felicity says makes him look like a hero. Pretty much the entire female cast is sidelined for this episode. Shado and Sara are girl hostages, with Shado being fridged to give Ollie and Slade angst. Thea and Sin are mostly there to fuss over Roy when he's wounded. Moira is decorating the Queen household for Christmas in solitude. Laurel is only there to cry over her father and to further advance Roy's mission. You know things are bad when lab-rat Felicity proactive female character in the episode and even she spends most of the episode fawning over how awesome Barry and Ollie are. Ollie's defending The Arrow's shooting Roy as a means of keeping him safe is lame even by Ollie's low standards for unbelievable lies. Ignoring the shabby treatment of the female cast, it's a damn good episode, a fitting set-up for The Flash TV series and a fine way to mark the midway point of the season.